You may remember that a few years ago we offered free workshops on a variety of topics. Well this year we are excited to announce that again we will be offering a number of free art based workshops again this summer! These workshops will be offered on two Monday evenings: July 9th and 23rd. Workshops will be running congruently at the same location. come at 6:30pm for some refreshments, then workshops officially begin at 7pm. Nellie is a local photographer who loves capturing moments, especially of her children and their adventures. She loves to look at a scene and figure out how to best convey what makes it special. In this workshop, Nellie will cover the basics of photography, including all you need to know about your camera like what to all the buttons mean and how do I capture what I am seeing? No previous experience required, but please bring a camera. 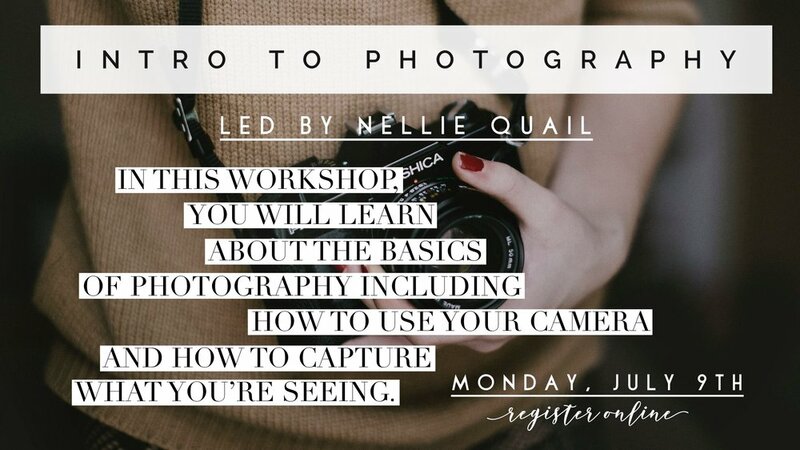 * There is a second photography based workshop by Nellie Quail on July 23rd. See details below. Bennett R. Coles is the award-winning author of four novels and a clutch of short stories. He is also the owner of Promontory Press, an award-winning, North Saanich-based publishing house. He loves working with aspiring authors, helping them to develop their craft and navigate the world of modern book publishing. In this workshop, participants will learn about the fundamentals of writing including story structure, narrative pacing, how to create complex characters and more. The workshop is applicable to both fiction and non-fiction writing. * There is a second writing based workshop by Bennett R. Coles on July 23rd. See details below. Ashley Opperman is the lead designer at Metropol Industries and an artist in Victoria, BC. Currently she is interested in incorporating evidence of the artist's hand within her digital designs. And in her art practice, she is working towards allowing honesty and personal experience lead her. Though, bold contrasts, organic textures and expressive brush strokes have become ongoing themes and motifs throughout her work. In this workshop, you will learn how to work with the medium of Ink. Ink is a truly diverse medium. It seems so simple - just black. Yet it can be anything from a stark, black, hard line, to a soft, grey wash. Ashley believes that a successful ink painting is found in the balance between white space, blackness and texture, and between relinquishing control and practiced technique. Come explore ink's boundless possibilities along with her! This is the second workshop by Nellie that will go deeper into what has already been covered in the first workshop and will teach on lighting, composition, and more. Attendance of the first workshop is not required. This workshop will build upon the first workshop, but attendance of the first workshop is not required. Content will be based upon the first workshop and participants requests. As this is a writing based workshop, it is recommended that participants be 15+. In this workshop, Kara will teach people how to properly make cake batter with tips and trick as to why things sometimes fail, how to fill the liners, how to tell when the cake is baked and more. You will also learn how to make the icing, how to flavour the icing, how to use, fill and pipe with an icing bag. We will also cover ideas for decorating such as fondant, chocolate, fruit, and how to fill a cupcake with filling. The skills would be transferable to baking any cupcake or cake. We ask for age to determine the various demographics that are accessing the workshops. Also, for all participants under 14 years old, we recommend attending with a friend and or guardian. We also ask that all participants are ages 12+ as the workshops will be geared towards adolescents and adults. Our building is wheel chair accessible and we are happy to make adjustments/ provide chairs, etc. when possible to have you attend the workshop in a way that is comfortable to you. Do you have any questions/ things you are hoping to get out of the workshop? While we cannot guarantee that the facilitators will be able to cover your requested topic, we are happy to let them know if there's anything you would like them to cover. Thank you so much! Please look for a confirmation email in the next few days with additional information from alicia@friendshipcommunitychurch.ca . If you do not receive an email, please reach out as your registration may not have been submitted. Thank you.